As these skewers cook, the smell of grilled plantains and pineapples will waft over your senses like a warm tropical breeze. 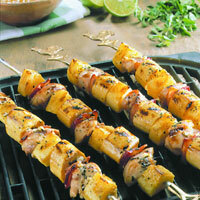 Thread chicken, bacon, pineapple, and plantains on skewers, alternating the ingredients. Set skewers in a glass baking dish. In small bowl stir together pineapple juice, lime juice, oregano, and garlic cloves. Pour pineapple juice mixture over skewers, turning to coat all sides thoroughly. Cover with plastic wrap and refrigerate for at least 30 minutes, and up to 24 hours, turning skewers occasionally. Before cooking chicken, prepare pineapple dipping sauce (recipe below). Prepare grill. When coals are hot, lift skewers out of marinade and brush lightly with vegetable oil. Grill over medium-hot coals for about 20 minutes, turning often. Stir remaining marinade into the pineapple dipping sauce. Boil pineapple dipping sauce over hot stove, stirring often, for 4 minutes. Pineapple Dipping SauceIn medium bowl, stir together vegetable oil, minced onion, pineapple fruit spread, and remaining marinade. Boil as instructed before serving.